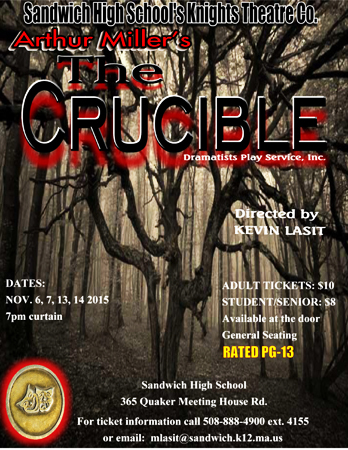 Sandwich High School’s Knight’s Theatre Company’s Fall show – The Crucible, is opening next Friday, November 6th and Saturday, November 7th at 7:00pm in the SHS theatre. Closing weekend is November 13 & 14, 2015. Tickets will be sold at the door. Tickets are $10 adults/$8 students. Please note that the content is PG-13. There are a total of 54 seventh through twelfth graders in the cast and crew, and we are so proud of the students and how they are handling this dramatic, intelligent, dynamic play based off the Salem witch trials.